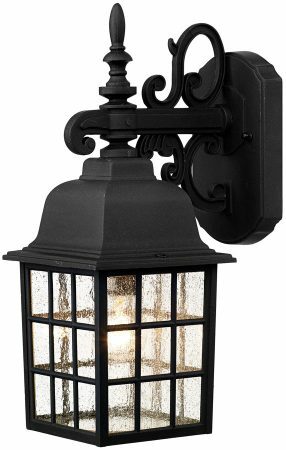 A traditional style downward facing outdoor wall lantern finished in matt black, with an ornate scrolled design wall mount and elegant Victorian reeded glass panels. IP43 rated and double insulated so no earth required. Five year finish guarantee. Other products in the Norfolk range can be viewed below and include a upward facing outdoor wall light.